For a number of years, I have been planting, selling, and generally speaking favorably of the Valley Forge elm, believing in earnest in the ability of this cultivar to withstand exposure to Dutch elm disease. Until relatively recently, this position had been based entirely on faith, as I never actually had had an opportunity to see any of the USDA test plots in which clones of this tree had been evaluated. All I had seen were a few reports that had been published at various times by USDA research scientists; and encouraging as the data had been, items of technical data are, after all, no substitute for first-hand observation in the field. Always in the back of my mind there was still this question: How would the trees which I had planted behave in response to their actual, inevitable exposure to the Dutch elm disease fungus one of these years? Although the USDA reports had given me some ideas of what I probably could expect, I still felt a need to see for myself something more concrete. In June of 2006, that opportunity suddenly began to present itself, ironically right in front of the very site where Acton's original meeting house (and later, two successive schoolhouses) once had stood. On June 16, 2006, only days after these three photographs were taken, I happened to go back to Meeting House Hill to do some further pruning on the tree, and to my astonishment I noticed some newly developed wilting on it. Though not extensive, the wilt was unmistakably present, and it was happening at precisely the time of year when symptoms of Dutch elm disease ordinarily start appearing on American elm trees in this part of the world. Was it possible, I wondered, that this Valley Forge elm might have contracted Dutch elm disease through natural vectors? If so, the implications could be far-reaching, especially considering the scope of my work with this variety. Uneasy as I may have felt, I knew that I needed to gain some definitive answers, for better or worse, about what in fact was happening. The symptoms were present on a few branches only, but since the affected branches were emerging from various heights along the main trunk, it was clear that the trunk itself was infected along most of its 20-foot height. When I examined the inner bark of one of the wilted twigs, I observed the characteristic brown streaking which likewise suggests DED. Immediately, I resolved to look upon these developments as representing a possible blessing in disguise, providing that invaluable opportunity which I had been awaiting for years. 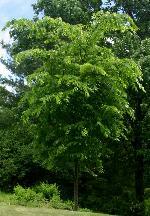 After all, the Valley Forge elm never had been purported to be "immune" to Dutch elm disease; no elm is. Rather, this variety had been described as being "tolerant" of the fungus, able to withstand its presence and to recover fairly rapidly from the damage which it causes, in dramatic contrast to the average, unselected American elm. Indeed, the Valley Forge cultivar supposedly had been known to kill off completely the DED fungus not long after becoming infected with it. In any event, the diseased tree at Meeting House Hill was going to do whatever it was going to do, and there was no point in my losing sleep over what in fact might turn out to be a notable victory for the American elm. If this cultivar really had the merit that it was supposed to have, here at last was a chance, it would seem, for me to see it for myself, independently of any USDA data, and then maybe to describe my observations in detail at my website. Conversely, if perchance my enthusiastic efforts over the years had embraced nothing more than a DED-susceptible piece of trash at considerable expense to many people, then I needed to know that, disheartening as the news would be. My faith was with the tree, however acutely I may have realized the implication of every conceivable outcome. The first step in pursuit of the knowledge which I was seeking would be to gain an official diagnosis from a reputable laboratory, thus ruling out once and for all any other wilt disease (such as Verticillium) which can produce symptoms similar to those of Dutch elm disease. I was fairly certain that this tree did in fact have DED, but the question needed final closure nonetheless. Then, with a conclusive diagnosis at hand, I would leave the tree to its own devices, rather than treating it or seeking in any way to cure it of its infection; for I knew that an ordinary American elm of comparable size under these circumstances would be dead in all likelihood by the end of that summer, whereas the Valley Forge variety was supposed to recover from DED infection entirely on its own, showing minimal crown damage the following spring and no trace of DED a year after that. Would this long-vigorous specimen at Meeting House Hill behave according to the variety's purported character, even without the knowledge of the USDA or any other research department? With a unique opportunity now at hand, I was determined to find out. So on that same evening (June 16, 2006), I called an acquaintance, an arborist who had a connection with the University of New Hampshire's Plant Diagnostic Laboratory, the services of which he often used for the determination of tree diseases. Hearing my description, he too was curious about the behavior of this particular Valley Forge elm, and he was glad to cooperate with me in an effort to have the tree tested. On June 21, with arrangements made, I collected a few samples of wilted branches from this tree, packaged them, and brought them to his place of residence, where he and I filled out a one-page "plant problem identification form" and enclosed it in the package. The following morning, the samples were on their way to the University of New Hampshire for professional testing. Meanwhile, the wilting at Meeting House Hill continued to progress on a small scale, and it now encompassed a few more branches than I had observed a few days earlier. It seemed to me that maybe 10 or 15 percent of the tree's crown was looking somewhat shabby, and I thought it noteworthy that the affected regions of the tree were almost entirely lateral branches at various heights along the main trunk. Indeed, most of the tree looked healthy enough, but the conspicuous wilting in certain sections of the tree increasingly bothered me as the days went by. On July 6, I decided to go ahead with some light trimming on the wilted branches, if only to make the tree look a bit better so that it would not draw too much attention; after all, I did not relish the thought of some cynic with a chain saw taking action hastily, knowing little about what in fact was going on. Besides, cutting back some of the conspicuously wilted twigs would not have any effect on the infection itself, since that obviously was pervading most of the main trunk. The infection was there, regardless of which branches might come off or remain attached; consequently, trimming the tree would not qualify in any sense as treating it for DED, such as I had determined not to do. So on July 6, I pruned the tree carefully for looks alone, and the tree looked considerably better afterward, though I also took care to leave a few of the wilted branches intact so that they could be observed over time; indeed, it hardly would have been possible to remove all of the wilt anyway. The next day (July 7), I received a call from the acquaintance who had assisted me in sending the wilted branch samples to the UNH laboratory. As he now informed me, the samples had been cultured professionally, and the results were in; the elm had tested positive in the laboratory for Ophiostoma novo-ulmi, the aggressive form of the fungus that causes Dutch elm disease, and a written report of this fact would be forthcoming within a week or two. 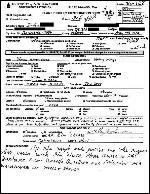 Sure enough, I soon received that report stating the fact in black and white. There was no longer any question about it; at Meeting House Hill in Acton, I was looking with knowledge at a Valley Forge elm that had become infected with aggressive DED through natural vectors, with symptoms plainly visible. The tree now was decidedly on the spot to show me its inherent DED tolerance or lack of it, once and for all, within a year or two. Though I told few people at the time, I was acutely aware that the outcome of this one tree's battle with DED could have profound implications for my entire project with elm trees. By this time, I was visiting the tree about every other day, monitoring it regularly for any further wilting. Although wilting continued to progress on a small scale for a few more days, the process appeared to have subsided by July 11. I pruned off a few more lateral branches on that day, and the tree still looked marginally passable, overall, with many healthy leaves and its basic shape intact; indeed, I thought the tree looked quite good, considering what it was up against. The attached foliage now consisted of healthy-looking, green leaves, still in abundance and predominant, along with brittle, brown leaves peppered moderately throughout much of the crown, with nothing in-between - that is, no further flagging or yellowing. The dead leaves were located mostly toward the bases of the lateral branches as they emerged from the main trunk. Despite the undeniable presence of wilted leaves in many sections of the tree, there was more than enough sturdy, green foliage remaining on the tree to persuade me that it had an excellent chance of recovering fully, assuming that its DED tolerance was an actuality in the field as well as on paper. Of course, I continued to check the tree regularly during the remainder of the 2006 growing season and noted that no further wilting developed on the tree during that year. 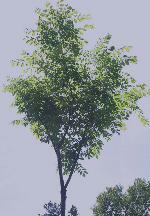 Although some brittle, dark brown leaves remained visible in the crown throughout that summer, the tree's condition appeared to have stabilized for the time being. The tree still looked healthy and leafy enough when it entered its seasonal dormancy in October, a fact which alone would seem to place it on a level far beyond that of the average American elm. Under these same circumstances, a typical tree of this species would have been totally dead by this time, with few if any leaves left to shed during the autumn season. This Valley Forge clone already was appearing to be an extraordinary American elm, although of course it remained to be seen how the tree would behave in the following spring, a fundamentally important consideration. Throughout the winter, I continued to feel optimistic about this tree's prospects for survival and recovery, and I looked forward to sharing, hopefully, a remarkable story of survival at my website in the fairly near future. In contrast to some American elms, the Valley Forge variety tends to flower profusely at an early age when conditions are favorable, as I have observed repeatedly over the years, so I was not surprised to see this nine-year-old elm at Meeting House Hill bearing flowers followed by samaras (elm seeds) in April of 2007. They were not present in great numbers, but were scattered sparsely throughout the crown. By April 25, the emerging leaf buds were conspicuously green and profuse on all but three or four small branches which were without any signs of life. Sure enough, I recognized those particular twigs as being among those on which there had been considerable wilting during 2006 and which I had left intact purposefully, but aside from those few dead twigs, there was no hint of dieback on the tree. It is probably true that more dieback would have been apparent at this time if I had not trimmed most of the affected twigs during the previous summer; however, the important fact to note in late April and May of 2007 was that the tree was continuing to survive its infection and was leafing out vigorously at a normal density. This fact is remarkable in itself; however, the disclosure of this tree's story regrettably would need to wait another year. The first sign of continued trouble came to my attention on June 1, 2007, when I noticed that four of the lowest lateral branches were wilting severely enough to warrant their removal. This development was unexpected and caused me some uneasiness, though I knew enough to continue keeping an open mind. This time, the necessary pruning made the lower half of the tree asymmetrical, although the upper crown was not yet showing any wilt. A few of the remaining side branches still looked healthy as well, and it seemed interesting that all of these branches were aligned on the same side of the trunk, as though the fungus were infecting it in a long, vertical line on the opposite side. This latest development was not enough to kill my hopes for the survival and recovery of this tree in the foreseeable future, but of course it strained them and renewed my concerns. In early June, it was clear to my perception that the Valley Forge elm at Meeting House Hill was engaged in an all-out war against the fungus, and that its victory, should it happen, would not be an easy one. It now seemed inadvisable to publish my observations before 2008, though of course I would continue monitoring the tree on a regular basis and keeping notes of my observations. A few important questions, at any rate, had been answered conclusively. 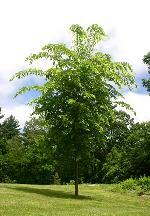 Is the Valley Forge elm exempt from contracting Dutch elm disease and expressing symptoms? Absolutely not. Does it require trimming when it does become infected at this early stage of its life? Yes, unless one is willing to put up with a shabby-looking tree for a time; Dutch elm disease is a formidable pathogen, the presence of which should not be taken lightly under any circumstances. On the other hand, do these facts mean that the Valley Forge elm is without merit in terms of resistance to DED? Not at all. The whole matter seems to boil down to a single question: When faced with a severe DED infection, can a Valley Forge elm fight for its life and win, entirely on its own - not only surviving the infection, but recovering to full, thriving health within a few years, showing no trace of the disease afterward? USDA reports answer in the affirmative, and if their assessment is correct, then we have a truly extraordinary American elm planted in the community many times over, and the species will live on to grace many generations to come. When I checked the tree again on June 6, 2007, I noticed for the first time that the bark was splitting in a six-foot, vertical crack along the height of the main trunk, exposing the inner wood along most of this length. The split was quite wide (up to 5 cm) in some places and was rather conspicuous, although it was obviously a recent development since it had not been apparent to me before this day. I also noticed that the inner bark of the tree already appeared to be closing in on the wound vigorously from each side, as though trying to heal the split. For the inner bark of an American elm to heal in this way in response to a wound is nothing out of the ordinary, but for it to heal itself over in response to severe damage by Dutch elm disease seemed like quite a rarity. On one side of the tree's crown, a few leaves were flagging anew, yet at this point it seemed to me that the tree had been trimmed enough and could afford no longer to have additional branches pruned off. There was nothing left to do but watch and wait, hoping for the best while fully expecting the tree to look rather shabby for the remainder of the year and to attract attention. 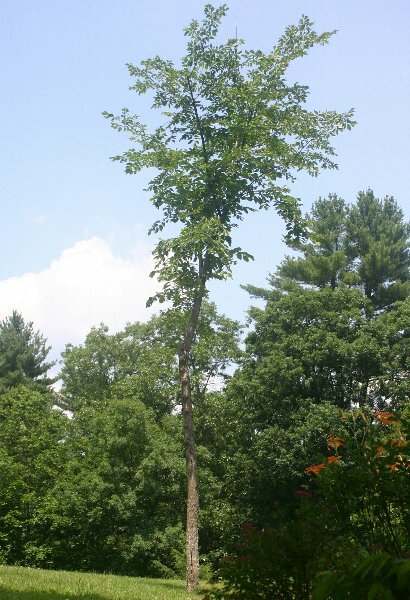 (As I would learn soon enough, a few people involved with other plantings at Meeting House Hill had in fact noticed recently the condition of the young elm and were wondering about it.) On June 18, the entire crown was showing signs of wilt, although the leaves were mostly green and intact toward the tips of the branches, whereas the wilted leaves were much more prevalent toward their bases. By June 30, the flagging seemed to have subsided, and many partially wilted leaves appeared to be regaining strength to some degree. During the first week in July, no further wilting occurred on the tree, which still was predominantly green but peppered heavily with brown, shriveled leaves throughout its crown. As in 2006 at the same time of year, the tree now appeared to have stabilized for the season; and once again, although the tree no longer looked attractive, it showed no further wilting or other symptoms during the remainder of the year. By October, the tree had survived a severe case of Dutch elm disease for two full growing seasons and still was holding on. In addition, the long split in the trunk was almost totally healed over, with most of the previously exposed wood now covered with new bark. The overall appearance of the tree at this point left much to be desired, but once again I considered its behavior to be remarkable and anticipated that it would survive another winter and would begin to recover from its weakened condition in the spring. 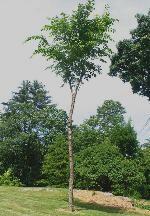 In April of 2008, the now ten-year-old Valley Forge elm at Meeting House Hill again produced a moderate number of flowers, followed by seeds, scattered sparsely through much of its crown. As in 2007, the leaf buds again emerged before the end of April with no sign of dieback on the remaining limbs. The tree was sprouting many new buds from the main trunk, and I promptly removed them to encourage the tree to retain its existing structure. Once again, it was apparent that the tree was continuing to survive its infection quite well and was leafing out normally, even after two years of severe disease and stress. Of course, I watched the tree carefully throughout the ensuing months and was relieved to note that the tree filled out well and developed no trace of wilt during the crucial months of May, June, and July. The importance of this fact cannot be overstated; the tree's behavior was in complete contrast to that of a typical American elm infected with Ophiostoma novo-ulmi, and there was no other way of looking at it without a considerable stretch of imagination. Through whatever mechanism, the tree had recovered fully from a naturally induced, severe infection with aggressive Dutch elm disease and had done so entirely on its own. It is important to note that two other Valley Forge elms of comparable age which I had planted in Acton (one at Nagog Hill Conservation Area, and one at the Acton Arboretum) had shown all the same symptoms to lesser degrees at two separate times in years past, and that they also had recovered completely on their own, each within a year or two after the first sign of wilt. Although it was never officially confirmed in either case, I now am convinced that they too are survivors of naturally induced DED. What makes the elm at Meeting House Hill unique is the fact that its symptoms were especially severe and were confirmed as aggressive Dutch elm disease through testing in a laboratory, thus ruling out any other possibility in terms of what may have been going on. One wonders if substantially older examples of this clone might fight off the fungus with considerably fewer observable symptoms; in any event, at the time of this writing (July 30, 2008), the ten-year-old Valley Forge elm at Meeting House Hill which had contracted DED naturally and had tested positive for it in professional laboratory culturing now appears to be completely free of disease and looks reasonably vigorous and robust, never having been treated for disease in any way. The bottom line is that a truly extraordinary American elm now stands healthier than ever for all to behold with awe and reverence, having withstood with flying colors a confirmed encounter with its archenemy. Update - June 18, 2009: For a second spring season in a row, the young elm at Meeting House Hill exhibited no further symptoms of Dutch elm disease and looks full and healthy, as shown in the two photographs above. (Click for larger version.) Looking at this tree, one never would guess that anything had been wrong with it. 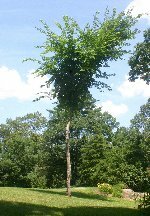 Coinciding with the sudden appearance of DED symptoms at Meeting House Hill, symptoms of Dutch elm disease also appeared suddenly on a previously healthy American Liberty elm that I had planted nine years earlier at Nagog Hill Conservation Area in Acton. Since the affected tree was the only example of American Liberty clone W-505 that I ever had planted anywhere, its performance has no direct implications about any of the other trees represented in my project. The wilt symptoms on that particular tree (a 12-year-old, 24-foot specimen) were extensive in June of 2006, and the tree unfortunately was dead by the end of that summer. It is true that I never had any samples from that tree tested in a laboratory, but that is because I did not need any convincing, nor did I feel that clone W-505 was worth the attention. For complex reasons, I had lost faith in that particular clone many years earlier. Still, losing an actual tree to DED within the sight of anyone who happened to notice was an embarrassment nonetheless. Perhaps it should be someone else's embarrassment first and foremost? I do not want to speak ill of ERI nor carry on about them; but it was they, after all, who had inspired me at the outset to place faith in all six of the Liberty clones, and to do so quite publicly. Is it too much to ask that they differentiate openly among the various clones in the American Liberty series, even though their patent could cover only one of them, and that they sell only those clones that consistently withstand natural exposure to Ophiostoma novo-ulmi, the aggressive form of DED which goes around in nature nowadays? In the past I have often felt that American Liberty clone W-502 had shown more promise, as this clone had appeared on occasion to fight off the beginnings of DED infection in localized regions of its crown. 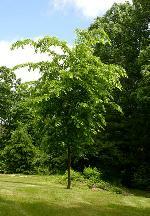 However, in June of 2008, one tree of this clone (a shapely 40-foot specimen planted in ideal conditions at the Acton Arboretum) suddenly showed considerable flagging and yellowing leaves, unmistakable symptoms of DED. 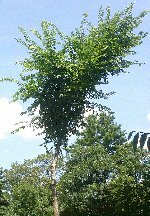 By the summer of 2009, although life was holding on in much of the tree's crown, it had become sufficiently defoliated to convince me that even clone W-502 should not be recommended for landscape plantings. Compared with the Valley Forge elm which had won the fight for its life at Meeting House Hill, this elm's behavior was a joke. Half the tree was leafless and trying to resprout from its lower skeletal remains; the other half was holding on only because the infection had more recently reached the tree's lowest limb. I have not cut down any of the Liberty elms which I had planted in the past, nor do I suggest cutting down any healthy trees, but I have come to regret placing as much faith in the Liberty elms as I once did. As for the few remaining Liberty elms in Acton that are not W-502's, so far they remain alive and well, and it is anybody's guess whether it will stay that way. Though I prefer to downplay them, I will say this much: It is simply ludicrous that I had to learn to identify the various clones of the American Liberty series entirely on my own, through independent research, against the seeming preferences of ERI. Had I not done so, I might well have lost faith in all of the Liberty elms that I had planted, upon losing one of the six clones to DED. Other elm enthusiasts and even research scientists under similar circumstances have done exactly that, or so I have been told by a number of separate, independent sources. What a price to pay for patenting one clone within the series and then referring to "the American Liberty elm" as patented, without disclosing any information about how to tell one member of the multiclone from another. It is abundantly clear from research reports and other sources that some of the Liberty clones are unable to hold out against Ophiostoma novo-ulmi, so why not promote the better clone individually, apart from any other clones that might mask its identity and keep it vaguely associated with a patent?